Aaron Copland called Lamy a wonderful young clarinetist in a 1984 letter reviewing Lamy’s recording of Gary Pratt’s score for the film Pasture Songs. Lamy’s teachers have included Mitchell Lurie, Rocco DiStasio, John Coulehan, Mary Gale, David Howard and David Breeden. While attending the University of Southern California Thornton School of Music, he received appointments to the principal clarinet chairs of the Debut Orchestra, Los Angeles Philharmonic Institute, National Orchestral Institute and Orchestra of the State of Mexico, as well as a one-year assistant principal residency in the St. Petersburg Philharmonic in Russia under Yuri Temirkanov. 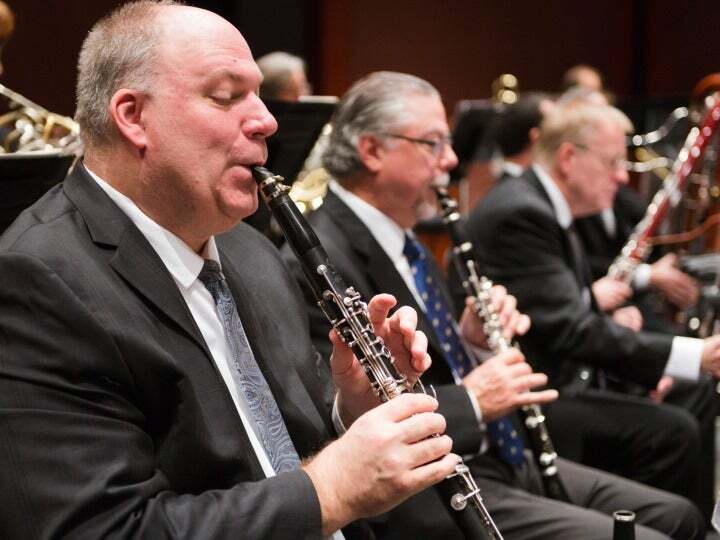 In 1991, Lalo Schifrin appointed Lamy to the clarinet section of the Glendale Orchestra. Soon after, he received invitations to perform with principals of the Los Angeles Philharmonic on the Gindi Auditorium Chamber Series, the Charleston Quartet, Los Angeles Wind Quintet and Mad Coyote Ensemble, as well as for Hollywood film soundtracks. He gave numerous concerto performances of Copland, Weber and Debussy with orchestras throughout Southern California. Lamy was a top prize-winner in the 1995 Boosey & Hawkes North American Clarinet Competition. Since then, he has performed more than 1,000 orchestral and chamber concerts in such prestigious venues as the Metropolitan Opera House, Carnegie Hall, Avery Fisher, Merkin and the New Jersey Performing Arts Center. He appears on seven Delos CD recordings with the NJSO, including the Orchestra’s Grammy Award-winning Dvořák Requiem album and, as principal clarinetist, on Gliere’s Red Poppy Suite. As a New York-area artist, Lamy has performed more than 50 times with the Metropolitan Opera Orchestra, including 10 Texaco Metropolitan Opera International radio broadcasts. He has also performed with the New York Philharmonic, American Symphony, American Ballet Theater, Concordia Orchestra, Royal Opera of London, JCC Metrowest Series and Cape May Music Festival. He has been a featured soloist with the Haddonfield Symphony and Debut Orchestra. An active music educator, Lamy is on the faculty of the New Jersey Conservatory, Drew Summer Music, Rutgers University and William Paterson University; he has been a guest master clinician at The Juilliard School. He is widely recognized as one of the nation’s leading clarinet teachers—his students have been heard on NPR’s “From the Top,” won numerous solo competitions and been accepted to top conservatories and music festivals nationwide.